The steady climb to the top of the Purple Mountain Trail isn’t very scenic, but the end of the trail has great views looking down at the confluence of two rivers. 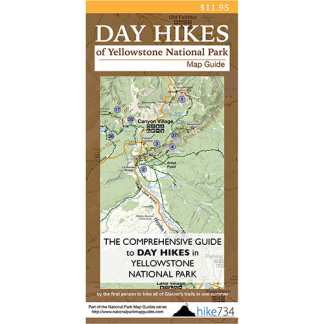 The trail begins in lodgepole forests and steadily gains elevation on the flanks of Purple Mountain. Views are very limited, but the forest is open allowing you to look deep into it. As you gain elevation, there are occasional views to the valley below. You eventually pop out at the end of the trail looking south toward the Old Faithful Area, from which the Firehole River flows. From the east, the Gibbon River snakes through a meadow and meets up with the Firehole River where it becomes the Madison River. 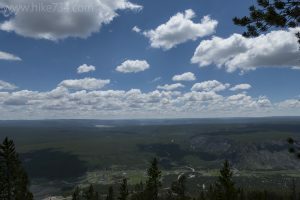 From this overlook, steam from distant hydrothermal features in the meadows accent the views of this landscape that is dominated by lodgepole forests. Trailhead: Just northeast of Madison Junction on the Grand Loop Road, look for the Purple Mountain signed trailhead.